Last weekend, I made a sort of confessional on my blog. In the post I need to move it move it, I admitted that I need to add exercise into my life. The WiiFit was not my thing and had to find something. Sunday night, while getting the little guy to settle, I turned on Exercise on Demand. I watched the start of several things and put them into my brain. After JSL was asleep, JL and I tried the DVD that I took out of the library. Problem: the wrong DVD was in the case. We turned to Exercise on Demand and decided to try Jillian Michael’s 30 Day Shed since I had been reading a lot about it. We ran into a few problems. First, we did not have enough space. Second, thanks to the lack of space, I encountered a jumping jack related injury from getting hit by my loving hubby. Third – damn Jillian makes you work hard! Talk about burning and hurting. I liked it in general, but until I have a bigger space it does not work well. The next day I was sore. I knew that this was a good thing. It meant that I was working my muscles. I started to do more research on exercise videos to try. I kept coming back to the same person. That person was Leslie Sansone and her walking videos. Tuesday, when NHL got home from school, I put the Family Walking video on and gave it a try. Wow! The boys and I had a great time and 22 minutes later I had an amazing workout. Wednesday morning the little guy and I set out to try another one of Leslie Sansone’s workouts. This time it was the Walk & Tone 2 mile routine. This was about 32 minutes and after I felt amazing. I was energized and wanted more. It actually made me obsessed with getting a DVD of my own. In the afternoon, I went out and purchased the only Leslie Sansone DVD that I could find. Last night, JL and I tried it out. We did the one mile routine. That made 3 miles and about 46 minutes of exercise for me yesterday. The shocking part, I wanted more! Early Thursday morning, the little guy and I were ready to "walk" with Leslie. I put on the new DVD and got ready to do 2 miles. I really liked it a lot and could feel it working, especially during the second mile. I felt like I could do more, but a certain toddler had other thoughts. Have you ever done a Leslie Sansone workout? If you have, is there one (or more) that you would recommend? Any other suggestions would also be greatly appreciated. Oh I used to do her workouts.. in fact I have several. I have the 1 mile and the 3 mile.. and the kick one. I loved it when I “did” it. lol I really think they are a good workout.. I remember when I first tried the one mile I was huffing and puffing just to get thru it lol I recommend them!! I haven’t–but maybe I should! I haven’t exercised since probably the first trimester of my pregnancy! No I haven’t. I’m not very good with dvd stuff. I get interrupted a lot. I Love Leslie! She is so much fun to walk w/ & I really enjoy “talking” w/ her while I walk! I have 5 & can’t remember what I have. But I love them all ’cause it doesn’t matter what your fitness level is or how you do them. You can’t do them wrong! No I haven’t and to be honest, I’ve never heard of her. 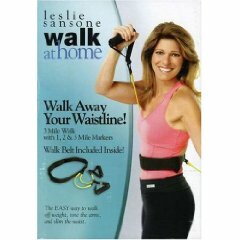 I have a lot of Leslie Sansone videos but I prefer to walk outdoors. I am a fitness walker and I use her videos in the winter when it is icy and unsafe for me to walk. She is good for a beginner. I have more fun loading my iPod with fast dance music and going for an hour walk. Never done one, might try one now though! ParentingPink’s last blog post..Oatmeal, Dinosaurs, and Destroying. I have never tried those. Gosh, I have never heard of her?? Sorry! But I power walk at least 5 times a week ~ I LOVE walking!!!! Sorry – I messed up my URL before! Nancy’s last blog post..TGIF. . What are your plans? . . Besides Aloha Friday, of course! I am not familiar with her exercise regime. So, I am no help!! No…I actually have never heard of her before! Sorry, I have never done one of them. I did give you an award over at my place today. Have a great weekend. No, but I HAVE heard of her before and seen her on several morning shows and she seems to know her stuff!! No just some pilates for my back strengthening. I think I have a video similar to this somewhere from when I was pregnant with child number one. I wanted to excercise but not over do it. I had not heard of Leslie but I have been looking for new things to try and it sounds like you really like it so it might be fun to try. I’ve never tried one of hers but I sure have a lot of Kathy Smith videos! I have one dvd of hers now, but haven’t started it. 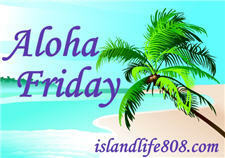 Emily’s last blog post..Sit back, relax, it’s Aloha Friday!! I have not heard of her. I am sure I am missing a great leader in the fight for fitness. The last program I used was Beachbody’s Tony Horton and other of their dvd programs. I am right now off the exercise and fitness wagon. I just have too many wagons on the trail. As I jump from one wagon to another I sometimes lose my way and forget one wagon so much that it drops off the trail. Sorry I can’t help with a recommendation, but thankfully I saw that other commenters have some suggestions. Thanks for stopping by my site. Your son must have an incredible story involving that bird. Thanks for the comment. I have not tried this so cannot comment on it. Stop by again when you have a moment. I haven’t tried that one. Good luck to you! I haven’t heard of it but I would like to check it out. Glad that you’re enjoying it. I need to inject regular exercise back to my life. Thank you for sharing. Rach (Heart of Rachel)’s last blog post..
Margo M’s last blog post..Aloha Friday: Barbie You’re Busted! No and I am looking for a good workout video- got get in shape for a wedding. Let me know how it goes!